Bellow are some tips to help you avoid plagiarism. If you are a U of R Biology student, you must also read "Avoiding plagiarism: A guide for students in the Biology Department at the University of Regina. The first step in avoiding using someone else's words as your own is to take good notes. Develop a system for tracking all sources as you take your notes. Record all bibliographic data and then write a paraphrase (or better yet, a summary) of the information you plan on using from the source. If you are recording the exact words, indicate this by using quotation marks and the page number(s). If you are recording your thought based on what you have read, indicate it with *MINE*. Keep your assignment document close while you are reading and taking notes. When you are done with your note-taking, open your assignment document. Reading and understanding primary literature can be a daunting task for those who are new to it. However, it is impossible to summarize information that you don't understand. For some useful tips on how to approach understanding scientific literature, please see How to read and understand a scientific paper: a guide for non-scientists. Start by looking up any words that you don't understand. Look for background information in a textbook or review article. You can even try Wikipedia, just remember that while Wikipedia is a good place to start, it should not be your final source. If you are still struggling to understand, try discussing the article with your instructor who has a lot of experience reading primary literature and may be able to clarify the material for you. Start by making the statement that you need to support, and then, without looking at your source, summarize what the source said that supports your statement. Remember to use simple words. The better your understanding, the better you will be at explaining complex ideas in simple terms. This takes a lot of effort. do not just rearrange the phrases of another author or paste together phrases from multiple authors. Even if you cite the sources, the above strategies will still result in plagiarism. Being rushed and under pressure makes you less likely to remember which words are yours and which are someone else's. While it is possible to over-cite your sources, it is preferable to under-citing. Your goal is to make sure the reader knows which thoughts are yours, and which are someone else's. If you think something is common knowledge but you are not sure, cite! Detailed paraphrasing examples from a lab manual. Bacterial diseases are a continuing threat. Their general decline over the past century is probably due more to public health policies and education than to “wonder drugs”. A case in point is Lyme disease, currently the most widespread pest-carried disease in the United States. From: Campbell, N. A. and J.B. Reece. 2002. Biology, 6th ed. Benjamin Cummings, San Francisco, CA. Over the last century, the incidence of diseases due to bacterial infection has decreased. This reduction is likely not due to the development of "wonder drugs", but rather to improvements in education and public health policies (Campbell and Reece, 2002). The most common pest-borne disease in the US is Lyme disease (Campbell and Reece 2002). This is old-fashioned but very reliable. Record only one pertinent note (paraphrase, summary or quote) per card. Make sure you clearly identify the source on each card and record the full bibliographic information; you will need this information to correctly cite your source. Advantage: When you are ready to organize your thoughts for writing, you can use the cards to physically lay out (group and order) how you will use the information. Advantage: Most people already know how to use at least one of these and it is easy to cut and paste bibliographic information. Disadvantage: It is too easy to cut and paste direct quotes and forget they are direct quotes. It can be hard to organize your thoughts when they are recorded in a single document in a linear fashion. This is a program neither Lauri nor Heather could live without, but it might be overkill for most undergraduate students. In addition to storing bibliography information in a database, this program organizes your PDFs in an intuitive fashion (kind-of-like iTunes). Can be used to easily add citation and bibliography material to your paper (saves you some typing). You can easily take notes as you read. You can only look at the notes for the paper you are currently looking at, so to organize your notes will take some cutting and pasting. Up until recently this program only worked for Macs, but there is now a Windows version. Costs $79 (undergraduate students get a 40% discount). Has a very functional iPad/iPhone/Android app (costs extra). This handy app works very well for organizing your notes in a database fashion. You can make notes, clip webpages and even add photos. 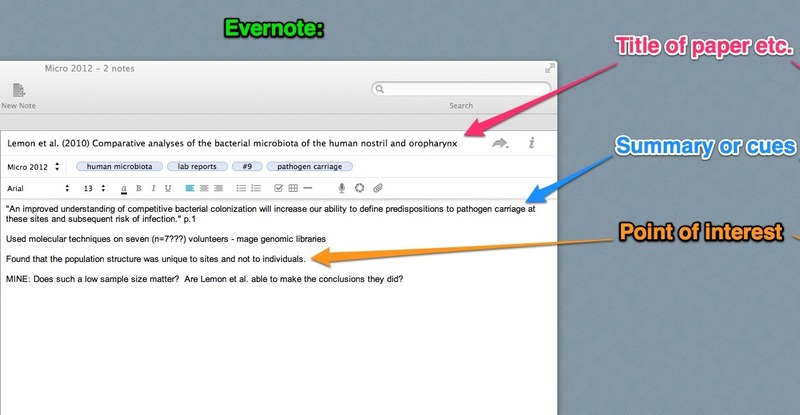 Organize your notes in multiple ways using folders and tagging. Works on Macs and PCs and has apps for most portable devices (i.e. you don't need to have your computer handy). Has both browser plugins and a stand alone version. The plugin usually recognizes when your browser is pointed at a citable source, and with a single click you can record the citation information. Citations are easy to organize (create multiple collections). You can add multiple notes to each citation (notes can be tagged). Attachments (such as PDFs) can be added to citations. Can clip and store full webpages (information you used will not be lost if the website changes). Always stores a link back to the page you were looking at. Has word processor plugins that can do most of your bibliography work for you. If you have a system you think others would find useful, tell us about it (add a comment).